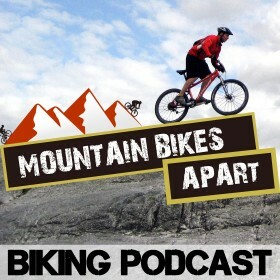 Here’s episode 7 of the Mountain Bikes Apart podcast. In this show, we talk about Tom’s upcoming races and how his training evolves as he gets into the middle of the racing season. We’ll also hear what Colin is preparing for and we answer another great listener question. We kick off with Tom talking us through his upcoming races. First he makes a fairly simple journey down south to Reading, UK for the 2nd round of the HSBC British Cycling National XC Series and then jets off to Romania for a UCI-ranked XC race and World Marathon Series double weekend on 29-30th of April. Romania isn’t somewhere either Tom or Colin have travelled to, so Tom should come back with some insights and stories to share! Training for MTB racing is dynamic and changes quite a lot from pre-season to competition season, so Tom talks us through some of the main differences. Mostly, pre-season training is characterised by larger volume, i.e. more training time, but at a lower intensity. This is to build up the necessary aerobic fitness to underpin the higher intensity work further down the line. As a general rule, training will become more specific to the demands of your racing the closer you get to events, so for most mountain bike racing, riders will introduce high intensity intervals into their program to develop their threshold and anaerobic fitness. This off/on way of training also accustoms the rider to the surging nature of MTB racing too. In this show, Colin and Tom get a great question from listener Greg Pulley, who asks about buying a bike for both himself and his son. Greg is wondering what bike to get to allow his son to start racing and which bike will be best for him to try and keep up! Colin and Tom’s advice to Greg had a few parts to it. First, both agree that it makes sense to look into a hardtail bike. With Greg on a budget, he’ll get more value for money with a hardtail bike, and for his son, the lighter weight will make it easier to manoeuvre and haul up climbs in a racing environment. We also advise looking for deals on last year’s models, as there a lot of bargains to be had! Except for a few small updates and a new paint job, a bike from last year’s range will be marginally different to the latest one, and you’ll find your cash going a lot further. Colin and Tom love answering your questions and hearing your feedback on the show, so if you want to ask anything at all or have some of your feedback read out on the show, please get in touch! Catch you in Episode 8!